If you have followed this blog in the past, you know that AddThis has worked to lead the way with open standards like OExchange and Web Intents. What you might not know is the engineers at AddThis are also leading the way with Open Source Software. 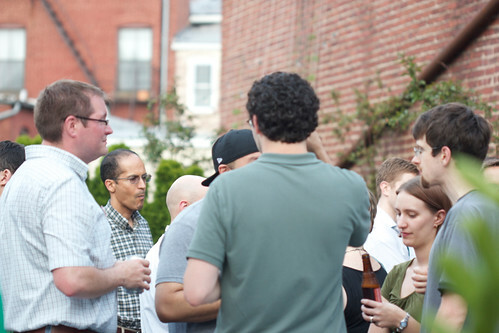 This month we sponsored the Second Annual Open Source Software BBQ in Washington, DC. Four local open source meetups, WordPress DC, DC PHP, jQuery DC, and DC Droids came together to celebrate open source software with some delicious pulled pork and an array of sides. In the past we have also sponsored individual open source meetups that focus on other open source projects including Cassandra and regularly host and sponsor the Big Data DC meetup which often discusses Open Source Software. In addition to supporting the local open source communities, the engineers at AddThis contribute to many open source projects, both the popular and the obscure. WordPress, GNU Emacs, CLISP, and Apache Kafka are some of the best known projects that we have contributed to. If that isn’t enough, the Stream-Lib, MetricCatcher, Phetric, and TracBoard projects all have grown from work we do at AddThis and have been made available to the larger development community. Checkout our github account to see some of the things we are working on now. If working on open source software and open standards interests you, checkout out our job openings. Sharing is Environmentally Caring! And Which Countries are Socially Green? 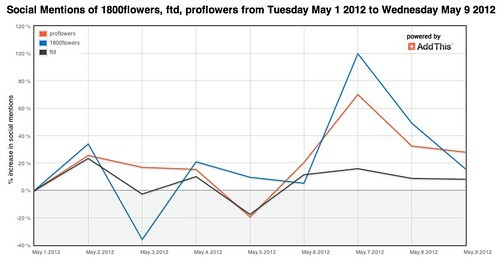 To commemorate the “greenest” day of the year, we looked at some of our network data to see what was going on in the social world on Earth Day 2012. Some of the most interesting stats were around printing and which countries are the most conservative when it comes to limiting their paper usage. 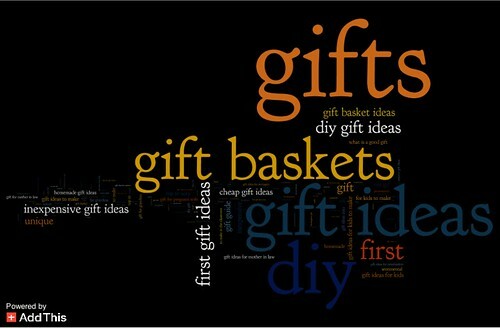 7% of social actions measured through AddThis’s sharing tools are people printing. In the United States, 11% of actions measured through AddThis are people printing. The French print twice as much as the rest of the world. Also getting a failing grade is Sweden – the Swedish are printing 20% of the time. The most environmentally friendly social countries are Brazil, India, Turkey. Mexico, Spain and Italy are just a few of the countries that print 7% of the time through our sharing tools. Sharing to social networks is environmentally caring as it reduces the need to produce as much physical content, which then reduces waste. We also saw a 200% increase in interest for the term “Earth Day” on the actual day of the celebration, April 22. 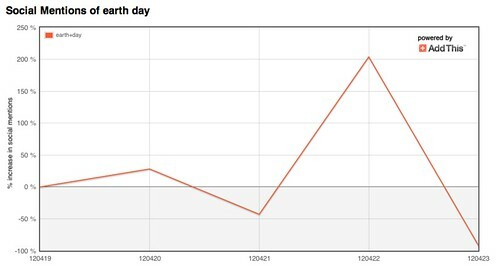 There was also a small spike on Friday, April 20 due to a high volume of articles being published about weekend activities surrounding the “holiday”. 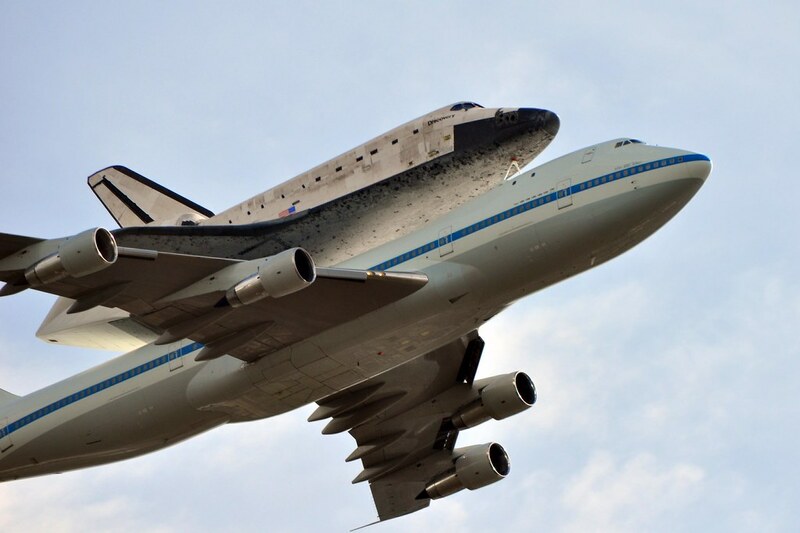 Yesterday morning the space shuttle Discovery made it’s final landing at Dulles Airport in Virginia, just down the road from the AddThis offices. The area welcomed Discovery with great enthusiasm, posting live photos of the shuttle on the back of a 747 all over Facebook, Twitter and other social networks. 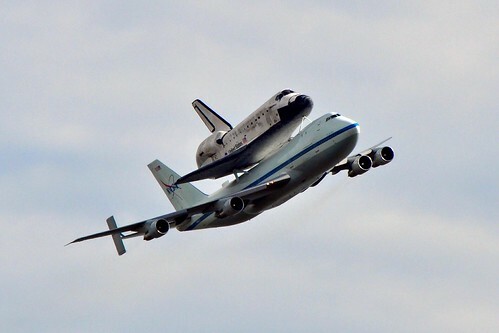 It is clear by the high intensity of interest in the Virginia and surrounding DC area that the in-person images of the shuttle arriving at its final destination evoked a lot of excitement! AddThis tracked what was hot at the Super Bowl and the Oscars, and now it’s time to spot what’s trending at the South by Southwest conference in Austin, TX. 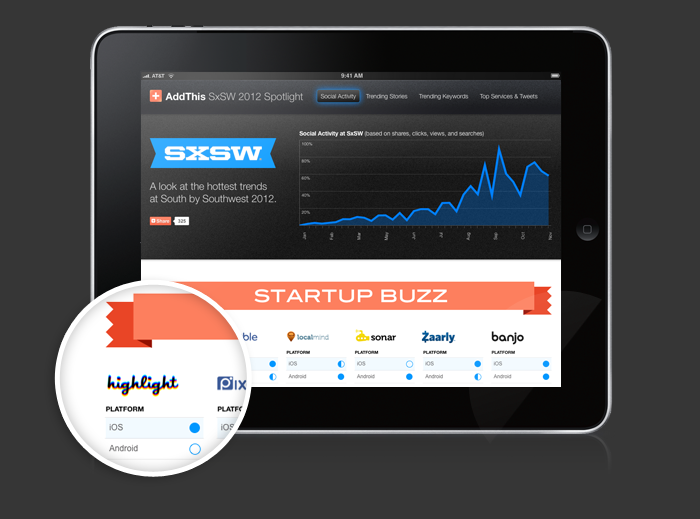 We’ve got the up-to-date scoop of which startups are buzzing and more on our SxSW Spotlight, powered by data from the AddThis network of over 12 million domains. Over the next twelve days we’ll be highlighting what people are sharing, searching for, and saying as they enjoy music, movies, and technology at this exciting event. Greg Cypes, our Director of Product, is on the ground in Austin as he has been for eight previous SxSW conferences. 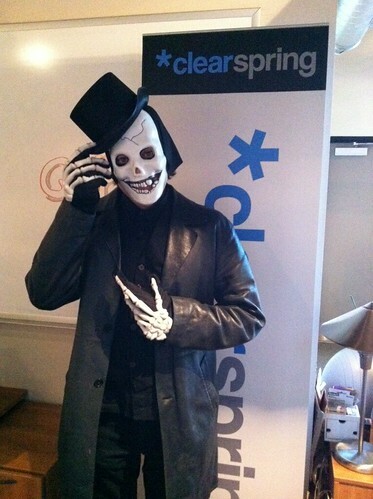 Look for him and the rest of the Clearspring/AddThis crew attending the event – we’d love to see you. The best way to reach us is to tweet at our SxSW twitter account: @AddThisSxSW. 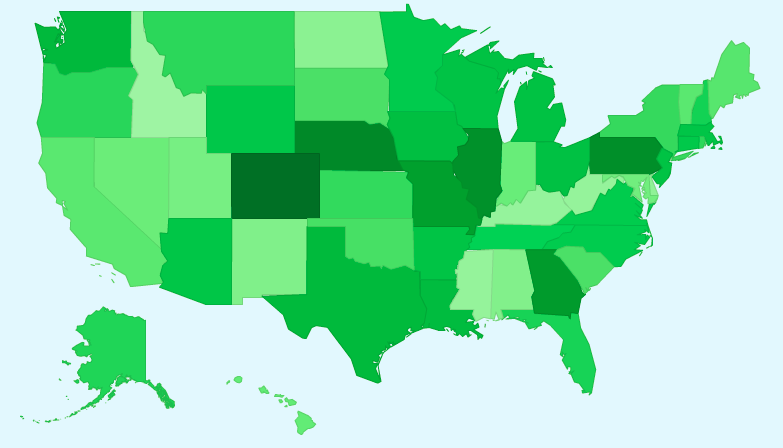 Also, If you like the SxSW Spotlight data and are interested in following more stats from our network, be sure to follow @AddThis, #ClearspringData or subscribe to this RSS Feed. 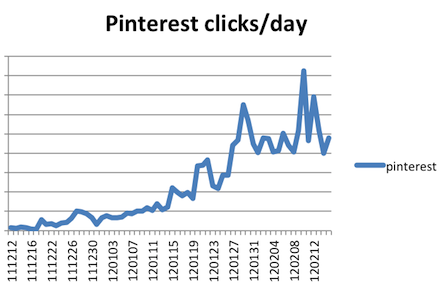 If you haven’t heard of Pinterest, you might be living under a rock. The image sharing site has catapulted into the limelight, becoming the hotspot for fashionistas, crafters and all inspiration-searching internet folk. Lucky for you, AddThis supports the Pin It button, which has become a hot commodity for our users. And who can blame them with Mashable recently reporting the service as a top traffic driver, especially for women’s lifestyle sites. So, don’t be the last one on the bandwagon. Get your AddThis implementation set up with a Pin It button, watch your photos get the inspirational love they deserve and turn that rock you’ve been living under into something like this! Social Activity during the Super Bowl Up 143% YoY! 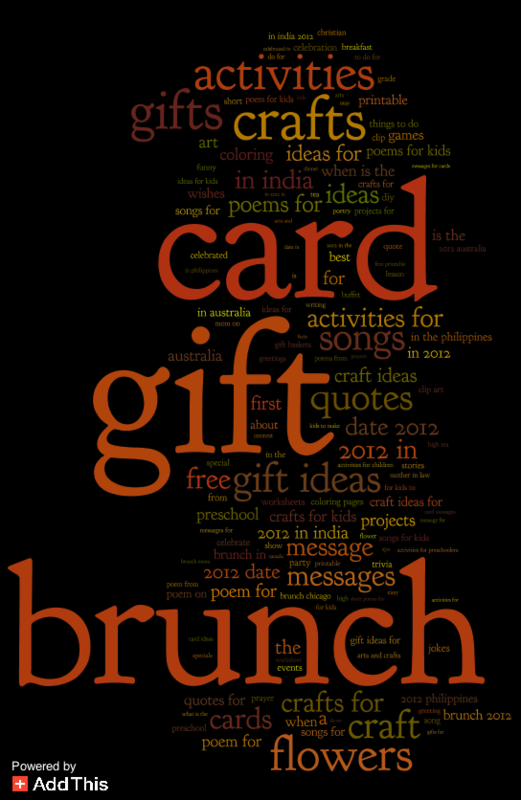 What was the Internet Buzzing About? If our pre-game analysis was any indication of fan-base, the majority of the nation is happy with last night’s outcome. 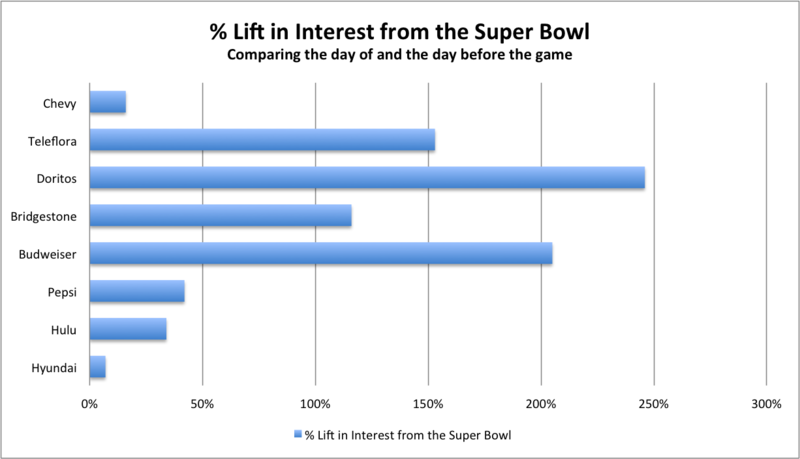 We analyzed millions of data points to bring you some highlights of the social activity that took place while the New York Giants took on the New England Patriots in Super Bowl XLVI. 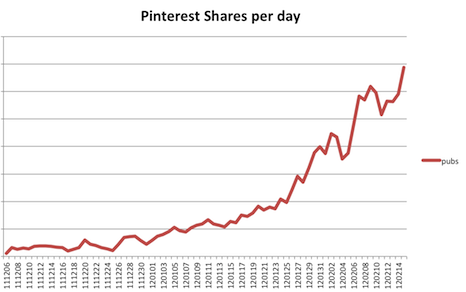 Activity was at an all-time high and amazingly, mobile sharing was up 500% from last year. Check out some of the online behavior that the game, commercials and performances inspired. 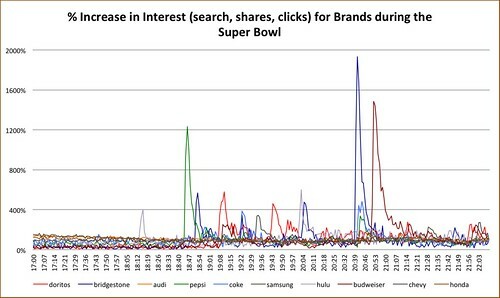 Bridgestone, Pepsi and Budweiser saw huge spikes in interest in their brand during the game. 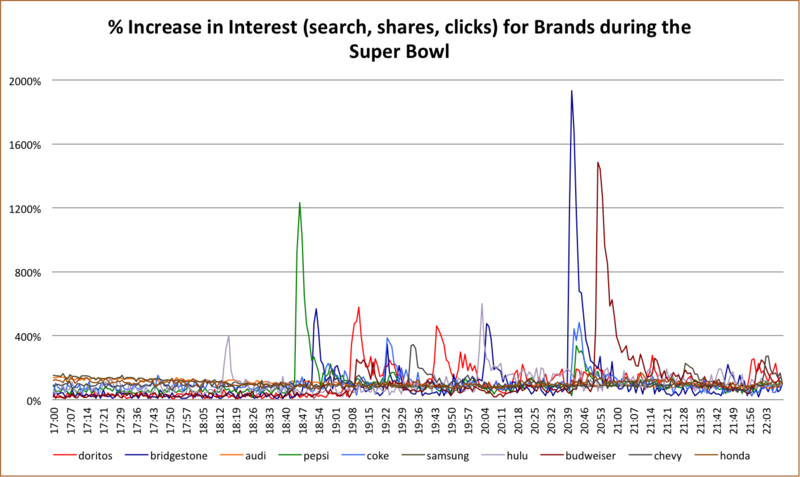 Anhueser-Busch ran four different ads, but you can see the final “Here Weego” spot had the biggest impact. As for the performances, perhaps we shouldn’t be surprised that M.I.A.’s much talked about obscene gesture had the most sustained interest throughout the 4th quarter and even after the game. 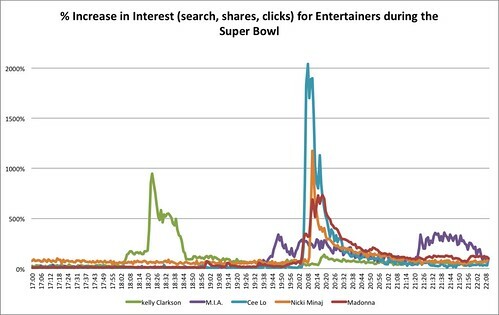 Cee Lo wins for generating overall most interest. 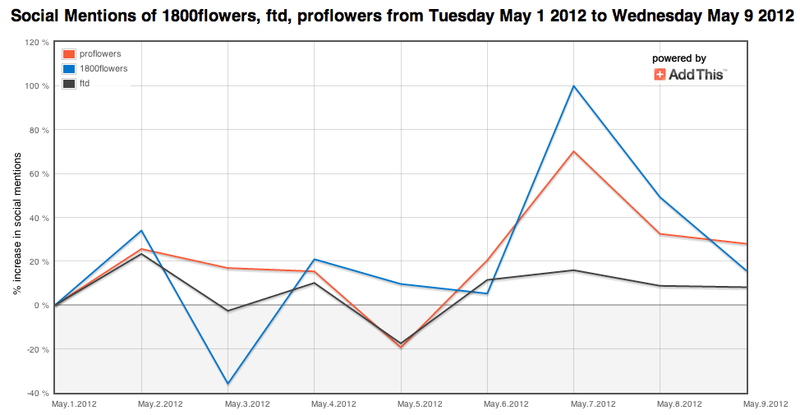 Doritos, Budweiser and Teleflora were the big winners in terms of percentage lift in brand interest. 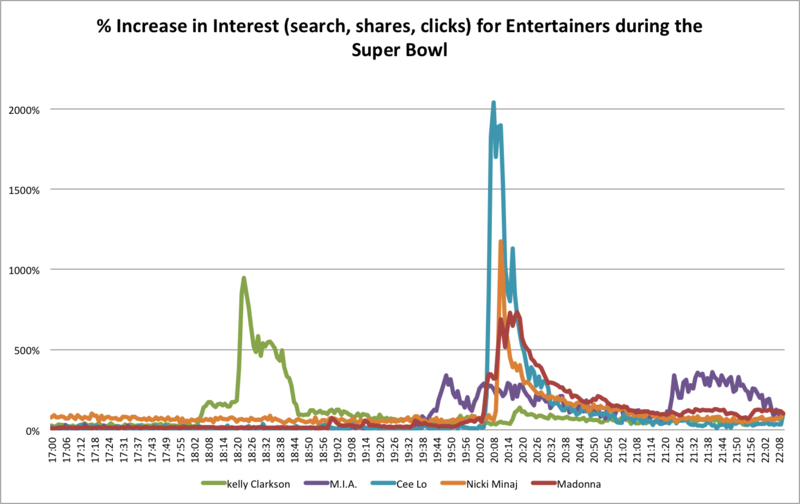 Below you can see the lift in clicks, shares and searches for each brand relative to the day before Super Bowl. 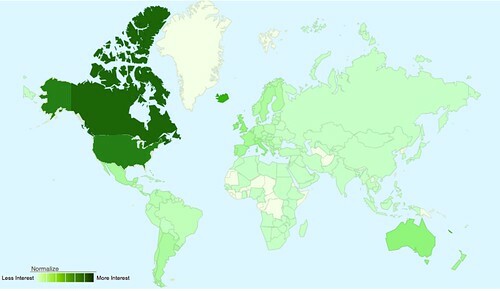 Looks like Canada was more interested in Madonna than the US! 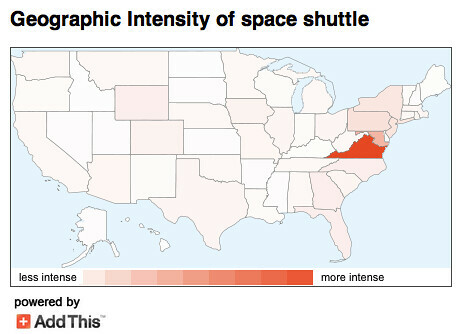 This intensity map illustrates the scale of interest in Madonna due to her flashy halftime show. 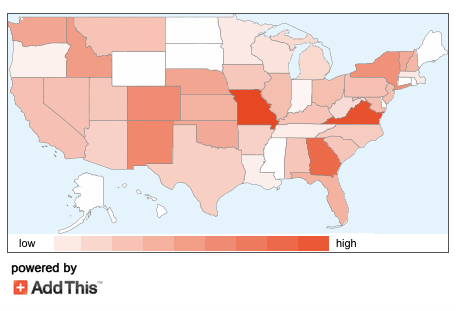 And, finally, this map shows a geographic break down of interest in Budweiser brands in the US. Bud’s got some big fans in Colorado it seems. Maybe the folks in WV and KY need a little elbow in the ribs. It seems Internet users are drifting away from email for much of their social correspondence and interacting more and more on social networks… and on mobile. Food for thought! If you have any questions about our data or would like more information about AddThis and Clearspring, please feel free to contact us. We’d love to hear from you! It’s the Great Pumpkin, Clearspring! It’s been a very busy week here at Clearspring with the announcement of XGraph joining the family. So busy, we didn’t get a chance to blog about our very first Halloween Costume Contest! 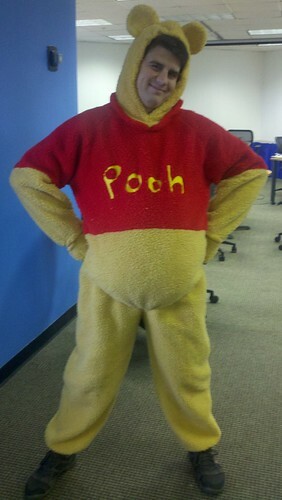 To give a quick rundown from some of our offices — Winnie the Pooh was spotted writing code and the iCloud was shedding “water droplets” all over the floors at HQ in McLean, VA. NYC was was raided by a zombie and a Richard Simmons exercise video extra showed up. LA even saw dead people. Here are some pictures, including the winners of the three categories – Funniest, Scariest and Most Creative. 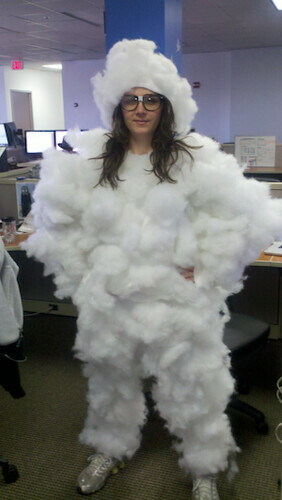 HQ’s Elizabeth Leiser won Most Creative with her rendition of the iCloud. LA’s Will Watson won Scariest for his interpretation of Dia de Los Muertos. Rebecca Salerno of our NYC office dressed as a hostess turned zombie. She has rats in her hair! 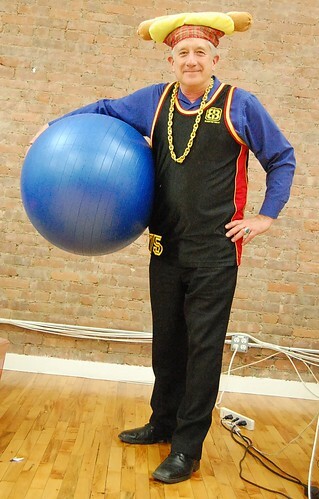 NYC’s David S. just got back from filming his latest exercise video with Richard Simmons. 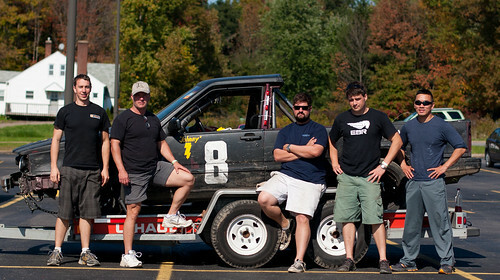 Last weekend the Clearspring Motor Club racing team, Cobra Kai, raced their Swedish Race Truck at Nelson Ledges Road Course in Ohio as part of the ChumpCar Longer Longest Day. After 25 hours, 25 minutes, and 25 seconds of racing—stopping only to change drivers and refuel the car every 2 hours—the checker flag dropped with our car in 13th place overall, a great result from a field of 74 cars that started the race. ChumpCar is a racing series similar to the 24 Hours of LeMons. The premise is simple: buy a car for less than $500 and run it on a racetrack for hours on end. The car that accumulates the most laps over the race is declared the winner. This sort of “crap can” racing isn’t just orbiting a circle track, nor is it a demolition derby. The tracks are complex and difficult to master. The danger is real, too—we wear helmets, head-to-toe fire gear, all of the cars have full roll cages, and the safety rules are extensive. In endurance racing the biggest factor is reliability. As long as you can keep out on the track without problems you have the basis for a good race. Performance can only take you so far and since the $500 price of the car includes any performance modifications, options there are limited. Our team has made great use of cutting things off of the car to improve performance. Before our first race we cut the springs and filled them with tennis balls to make the suspension stiffer. 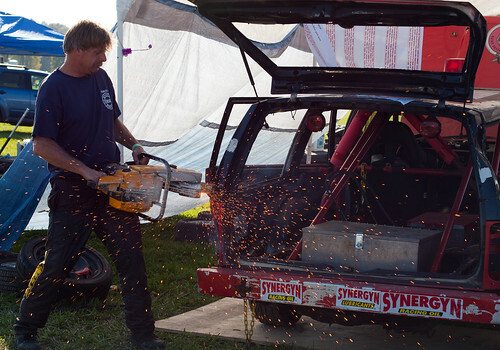 At our second race, the ChumpCar 24 Hours at VIR, we turned the race wagon into a truck by chopping the roof off while waiting in line to get into the racetrack. Our car’s performance from this weight-saving modification were enough to encourage another team at our most recent race to do the same with their Volvo. Overall we had a great race without any problems that kept us off the track. Ending up in 13th place—ahead of dozens of cars that were turning faster laps when they were on track—is an wonderful achievement. For complete details on our race, check out this post on the CS Motor Club blog. Next time, we’re shooting for the top ten! Think this is awesome? Check out the jobs page, we’re always looking for new drivers folks at Clearspring. My first week as a Springer! 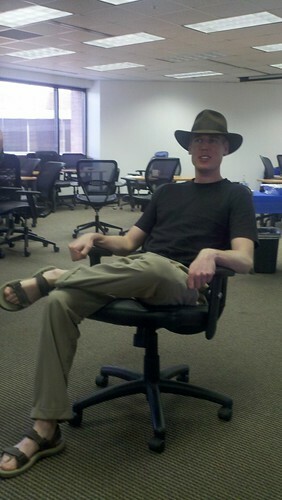 Last week was my first week here at Clearspring and already I feel like a part of the family. Maybe it’s the daily catered lunches or the Wii Tennis Tournament we had on Friday (Jeff and I clinched 2nd place!) or perhaps it’s because my desk is right next to the snack table (don’t worry, I don’t judge!) — but whatever the reason, everyone’s made a genuine effort to introduce themselves and make me feel at home. As with most new jobs, the first week consists of trying to learn new names with faces to match, who does what, where you need to be when, and the ins and outs of how to get this or that done. Lucky for me, my coworkers made that (typically overwhelming) experience an absolute joy — I don’t know that I’ve ever walked into a new job and felt so welcomed! What I love is there’s a clear “work-hard, play-hard” aura in the office and it’s evident how much Clearspring employees enjoy their jobs. Knowing that I’ll be working with people who exude such positive energy combined with seasoned skills, talents, knowledge, experience and passion is both refreshing and motivating. I’m extremely happy with this opportunity to work with such an excellent team, and I look forward to learning from them and sharing that knowledge with you!